Last I checked, this anime was available on DVD at Amazon. The above info came from crystal lindo, and was edited by yours truly (contact me). The image came from Anime News Network. Is your favorite character lacking a profile? Then submit a character profile! Just don't steal a description from some other website! Seven royal families reign over each of the seven kingdoms, and they have continued to prosper inside the planet for a long time. However, Ohisama no Megumi or the internal star is beginning to die, and it has been forecast that it will disappear in one year. If it disappears, all of the planet will be ruined. Twin princesses Fine and Rein receive a secret mission from Grace to investigate the reason for the star's decline. Using the power of the Prominence, they can hope to rescue the Ohisama no Megumi. Later in their investigation, an evil chancellor named Roman becomes so interested in the power of the Prominence that he steals the Prominence for his own good. After he unleashes the ultimate enemy, the entire storyline changes. Later in the series, Prince Bright becomes evil under the powers of the darkness and Poomo. He attempts to rule the whole of Fushigi-boshi using the powers of evil. During this period, Fine and Rein, along with other people, investigate the causes of evil and Poomo. The above description came from crystal lindo, and was edited by yours truly (contact me). 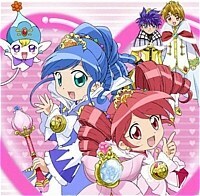 Fine and Rein as well as the other princesses leave Fushigi Boshi to attend the Royal Wonder Academy of Education. This prestigious institution is the school where Princes and Princesses from all of the planets come to receive their certification to become Kings and Queens. Upon arrival to school, Fine and Rein's unprincess-like actions cause them to violate school regulations. As a punishment, Fine and Rein lose points for their wrongdoing. During the orientation of 1st-Year students, the vice-principal presents a legendary bell that will only ring when a certain person touches it. If the bell rings, the person is classified to be the "Universal Princess". No princess had ever rung the bell before. Toma, the new president of the student advisory, opposes friendship and happiness in the school. When something happy approaches, he sends in monsters to enforce his thought.